Cuba has a very low per capita income, yet in the non-materialistic, quality-of-life domain, it excels. Thus Cuba represents a paradox. It is a materially poor country that has First World education, literacy, and health care. It is rich in human development resources and low in environmental burdens, but its standard of living, and therefore its fossil fuel use and CO2 emissions, is very low. Cuba has maintained its human service programs—free education, old-age support, basic nutrition, and free health care—throughout its Special Period. 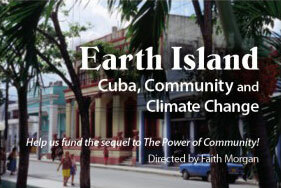 In 2006, Cuba was the only country in the world rated as having “sustainable development” in WWF’s Living Planet Report. Fidel Castro has said that “consumer based societies are incompatible with the saving of natural resources and energy that the development and preservation of our species require,” and Cubans simply have less of all material goods than people in industrial countries. They have much smaller homes (about 150 square feet per person in Havana compared with the U.S. average of about 800 square feet). Fewer than 10 percent of Cubans have private cars. They rarely fly. The consumption of common consumer personal goods is very limited. Yet Cubans don’t need to fear cancelled medical insurance. They know their children will be educated without being saddled with student loans. Cubans are not weighed down with enormous debts. They know they will not go hungry or homeless. “We need a global energy revolution,” according to Mario Alberto Arrastia Avila, an energy expert with the energy information center Cubaenergia in Havana. “But in order for this to happen, we also need a revolution in consciousness.” A clear revolution of consciousness would involve the acknowledgement, strongly resisted by richer nations, that CO2 emissions are directly related to material consumption. 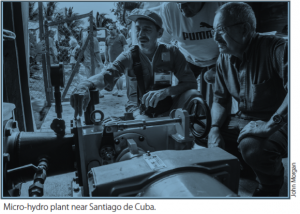 Cuba represents an alternative, where material success as measured by energy consumption is secondary, while other quality-of-life issues are given priority. The message is clear: humanity will survive and can even thrive in a resource-constrained world if it learns from the Cuban example. To purchase State of the World 2013 Is Sustainability Still Possible? can be found at the Worldwatch Institute.